The SEF is a public financial fund for financial support to Slovenian micro, small and medium-sized enterprises (SMEs) with favourable guarantee, credit and equity lines for the growth and development of the SMEs and start-up lines for new enterprises. The purpose of SEF’s operation is to improve access to affordable financial resources in the market. 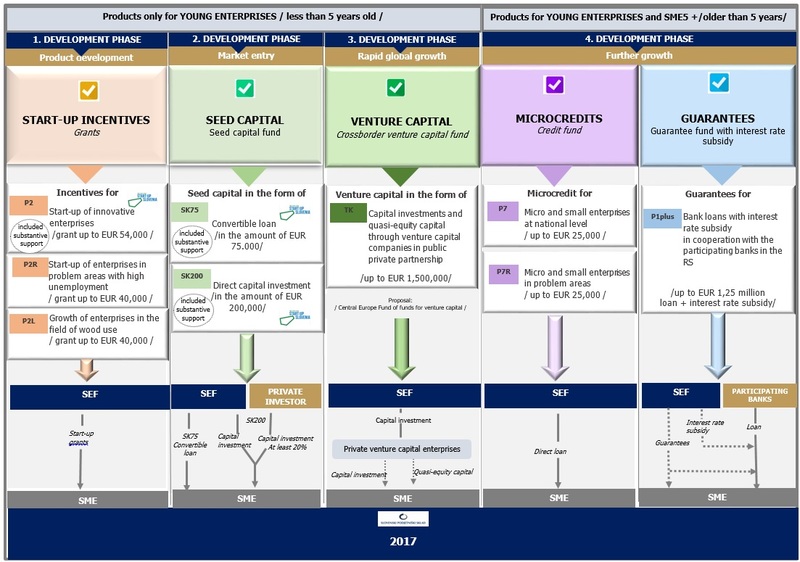 To achieve that purpose the Fund offers financial instruments in the form of: Start Up Incentives to young enterprises (start-ups less than 12 months old) in the first development phase, Seed Capital to young enterprises (less than 5 years old) in the second development phase and their entrance on the market, Venture Capital for the fast-growing innovative enterprises in the third development phase in the form of capital investments and mezzanine loans together with private investors through venture capital companies, Microcredits represent direct credits of the Fund at an affordable contractual interest rate and Guarantees as collateral for bank loans with interest rate subsidy that represent the largest share of the approved funds of the Fund.